We are a family of dal-lovers. We were a family who took many short road-trips, to be out of the city and to get some fresh air into our lungs. It was during one of those trips at a roadside dhaba, I ate the most flavorful and simply-made bowl of rajma with fresh roti from a tandoor. It was all that it promised - creamy, not-too-spicy and with a big dollop of cream & fried chilli on top. I was an enthusiastic 11-year old, discovering new food (with the help of my mother) and that combination simply bowled me over. I still remember my school friends from Northern part of India just couldn't understand the zealousness and what was such a big deal about it!. 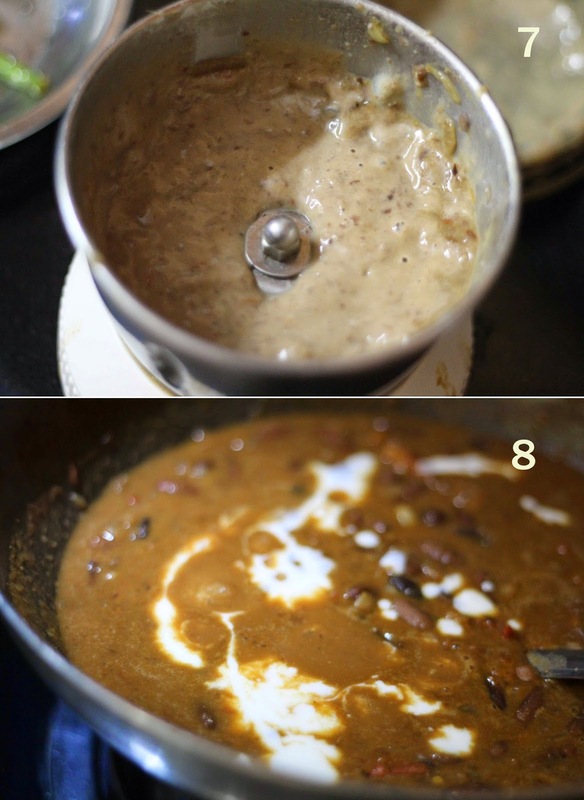 Till today, the memories of that first bite are fresh and this recipe for red beans curry with rice or bread is (and will be) my absolute definition for comfort food. Enjoy! This recipe is an entry to My Legume Love Affair # 81, hosted this month by me. Have you sent yours yet? Update: Here is a lovely roundup of all recipes submitted to MLLA 81. 1. 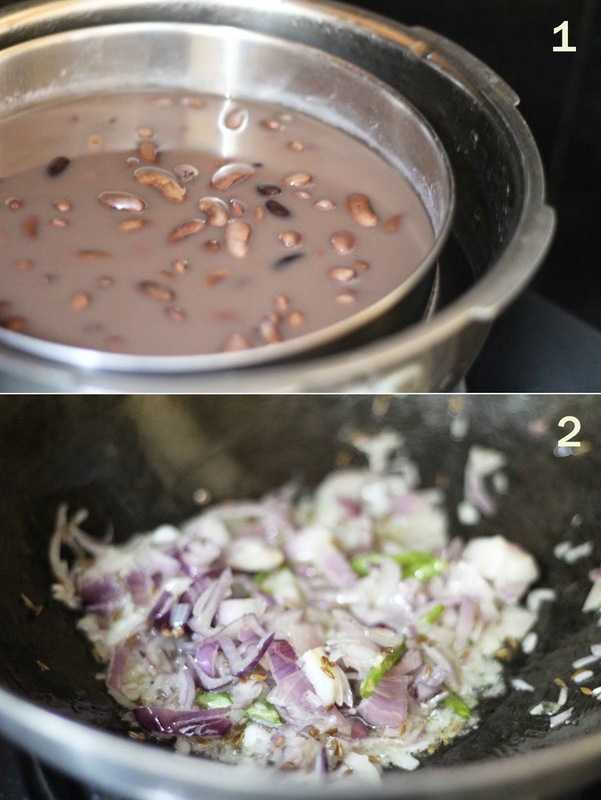 Prepare the dried beans: Wash and rinse the beans 2 or 3 times with water and soak with renoughwater overnight. Drain, rinse once more and pressure cook with green tea bag, cinnamon stick, black peppercorns, bay leaf, green cardamom and cloves for 3 to 4 whistles - until they are fork tender yet still hold their shape. Once the pressure releases, discard the spices. Drain and reserve the water as we will use it as our cooking liquid later. Personally, I think pressure cooking beans is a faster way than a stove top. If you don't have one, feel free to cook them with lots of water until they can be squished easily between your two fingers. Check out this post for more detailed instructions. 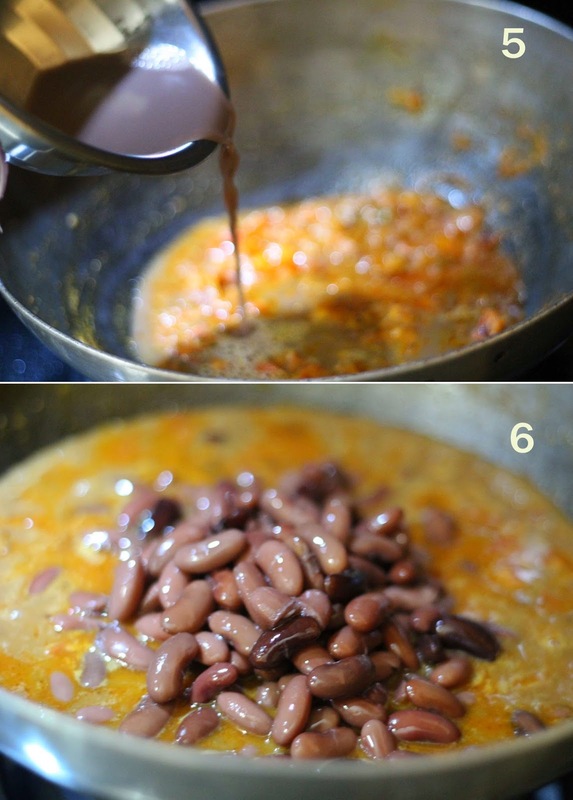 ** If short of time, skip this step by using canned beans. Drain the canning liquid and rinse. Proceed to next steps. 2. On a low-medium flame, melt butter in a pan and add cumin seeds + hing. Once they start to sizzle, add onions. Cook for a minute or two and then add the ginger garlic paste + green chilli. Continue to fry for one more minute. 3. To the lightly browned onions (on low heat), add the spices - turmeric, salt, red chilli powder, coriander powder, garam masala powder and mango powder. Quickly mix everything together. 4. Next goes in the tomatoes and tomato puree. 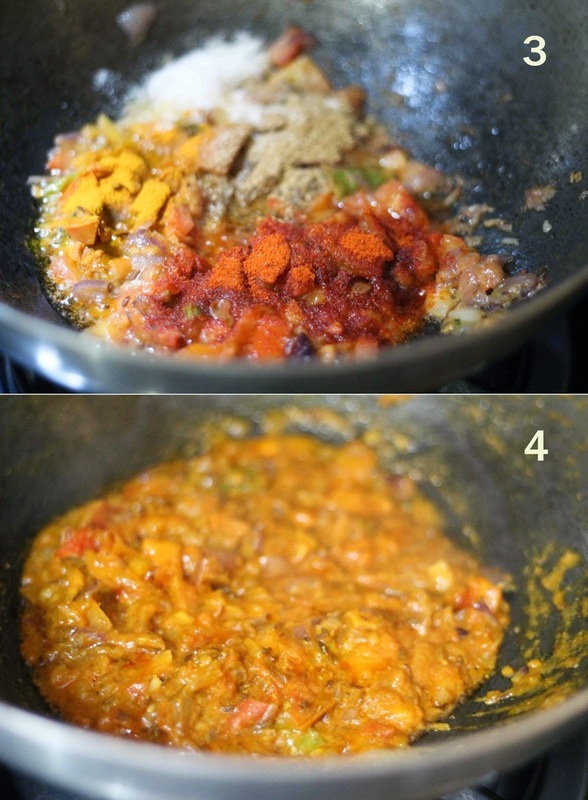 Mix well and cook until tomatoes are broken down and it becomes a mushy mixture. 5. Remember we saved the cooking liquid from pressure cooking beans? Time to add that now (about a cup). If you are using canned beans, use just water or stock. 6. Add boiled beans. Mix everything together and cook for 5 to 6 minutes in low heat. 7. To give the curry a creamy texture, take a small portion of curry, cool it down a bit (while rest of the curry is simmering on low heat) and grind into a fine paste. Be careful of hot splashes while grinding. 8. Add the ground bean paste to the curry along with cream. Mix everything together and add more/less liquid depending how thick you want the consistency to be. Cover and let it cook on low heat for 10 to 15 minutes. Transfer into a serving bowl, top with more cream (optional), coriander leaves and fried green chillies. Serve with rice/roti with chopped raw onion plus lemon wedges on the side. Heaven! Ohh the curry looks sooo tempting Siri! This is anyway my fav curry, I prepare it almost every weekend with rice.